Readers interested in the psychology of non-Western peoples will find this volume provocative in both descriptive and theoretical detail. The first book-length study of Thai psychological life, Thai Peasant Personality describes the members of a peasant community whose dominant personality traits are aimed at the maintenance of their individuality, privacy, and sense of self-regard. In addition, it offers suggestions for handling many of the theoretical and technical problems crucial to cross-cultural personality research. 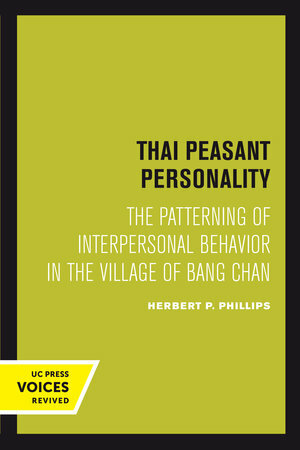 Basing his research on two years of fieldwork in the Central Plain community of Bang Chan, Herbert P. Phillips offers a systematic analysis and comparison of two kinds of data: observations of the villagers’ overt behavior in workaday social encounters, and their subjective responses to a special psychological test. Readers will find particular value in his discussion of the design, translation, and implementation of psychological research methods in non-Western cultures. Phillips analyzes the central role of affability and play in the villagers’ daily contacts, their use of politeness as a “social cosmetic,” and the implications of this cosmetic for the inner lives of the Thai. He examines the villagers’ readiness to become involved with others and the links that tie them together over time. He demonstrates how the individualistic tendencies of the Thai intrude on the stability of interpersonal relationships and how all social interactionin Bang Chan is set within a framework of cosmic unpredictability, with human volition only one of several indeterminate and uncontrollable factors in life. This “loosely structured” system of social relationships is seen to have its roots in early childhood, with strong support from both Hinayana Buddhist doctrine and the sociologically simple and undifferentiated nature of Bang Chan society. In presenting the psychological test results, the author examines the villagers’ attitudes toward authority, dependency, and aggression; their anxieties and reactions to crises; and their dominant drives and wishes. These various issues are linked to the theoretical problem of conformity and to the basic human need for privacy and psychological isolation. This title is part of UC Press's Voices Revived program, which commemorates University of California Press’s mission to seek out and cultivate the brightest minds and give them voice, reach, and impact. Drawing on a backlist dating to 1893, Voices Revived makes high-quality, peer-reviewed scholarship accessible once again using print-on-demand technology. This title was originally published in 1965. Herbert P. Phillips is Professor Emeritus of Sociocultural Anthropology at the University of California, Berkeley.